The jig is up. Rajasthan Chief Minister Vasundhara Raje can no longer deny knowledge of any document made in her name in support of Lalit Modi. The BJP can no longer jump to her defence and asked for a signed document to be produced before it can consider any action. The game-changer came when the Congress, on 24 June, released a document signed by Raje which was submitted to a UK court in support of Modi's immigration application. An unsigned version of the document had been released by Modi's own representatives earlier, but its veracity had been questioned. But now, the only questions that remain are why did Raje choose personal friendship over propriety? Why did she publicly lie about this document over the last few days? And how will the BJP react? The damning document signed by Raje is dated 18 August 2011, about a year after Modi had fled the country citing threats to his and his family's life. Agencies like the Enforcement Directorate and the Income Tax Department were building cases against him for financial wrongdoings in relation to the Indian Premier League, and his own former friends in the Board of Control for Cricket in India had suspended him, pending a probe into 'anti-BCCI activities'. But Raje defends him wholeheartedly. Raje, whose personal and family friendship with Modi goes back decades, was the leader of the opposition in the Rajasthan assembly at this time, having lost the 2008 elections after a five-year term as chief minister. For much of her term, Modi was president of the Rajasthan Cricket Association, which became his stepping stone to the BCCI, and he helped monetise both bodies. "Lalit broke up many of the old, clan-based strangleholds and politicised structures that had held cricket back for so my years in India. Lalit recognised the huge commercial potential of cricket and set about releasing that potential. The results were astonishing and I credit Lalit for having revolutionised cricket in both Rajasthan and later, across the whole of India. By leading this revolution from Rajasthan during my tenure as chief minister, Lalit became widely recognised as someone closely associated with me," Raje states. "Lalit's close connection to me has resulted in huge animosity towards him from the Congress party, both at the Rajasthan and national levels. The political attack which is currently underway against Lalit in India is, in my opinion, designed to destroy Lalit's reputation, to keep him out of Rajasthan cricket and politics and to thereby discredit me. "Given my close understanding of, and involvement in, Indian politics, I have absolutely no doubt that the broad full-frontal attack that Lalit is currently facing in India is politically motivated," she adds. All this could still have been explained away. But at the very beginning of the statement, there's a line that implicates Raje in a deliberate cover-up. "I make this statement in support of any immigration application that Lalit Modi makes, but do so on the strict condition that my assistance will not become known to the Indian authorities," she says. Why the secrecy, that too from Indian authorities? Is it because she had a sense that what she was doing was wrong? That she was helping a man who was facing humongous corruption charges escape the country? What Raje did four years ago has now come back to haunt her. Till the time the document did not bear her signature, she could deny it and state that she didn't know of its existence, which she did. Her party, the BJP, could also back her - even if reluctantly - and question the document's veracity, which it did. But the appearance of this signed document has changed the situation dramatically. Raje has gone into a huddle with her Rajasthan BJP colleagues, who have continued to support her in media statements, but seem a lot more tentative. The BJP itself is on the back foot, since Raje's allegations that the charges against Modi are an act of vendetta by the Congress go directly against Finance Minister Arun Jaitley's assertion that Modi is facing action from the Enforcement Directorate and the Directorate of Revenue Intelligence. 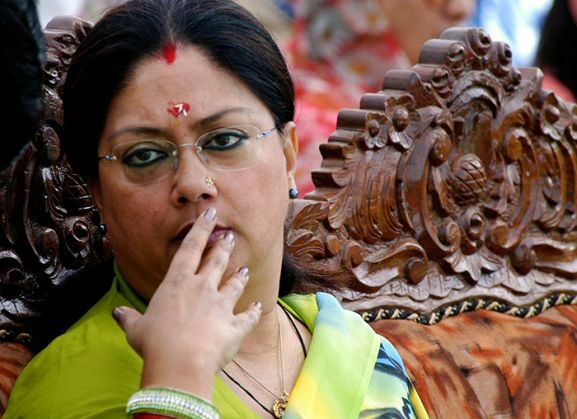 Raje's allegedly abrasive relationship with the BJP and RSS brass will also not help her case. What makes things even worse for Raje is that her son, Dushyant Singh, a BJP MP, is alleged to have had shady financial dealings with Modi, and her support can be viewed from a conflict of interest angle as well. Modi has been accused of shady dealings through a Mauritius-based company, which involved his company -- Ananda Heritage Hotels Pvt Ltd -- and Niyant Heritage Hotels Pvt Ltd, owned by Vasundhara's son Dushyant and his wife Niharika. Ananda is alleged to have invited fictitious share applications, after which a sum of Rs 10.33 crore was deposited with Wilton Investments in Mauritius. This firm then bought shares worth Rs 21 crore in Ananda. Ananda then gave a loan to Niyant, and then bought shares worth a total of nearly Rs 8 crore at inflated prices. On 25 June, the day after the signed document by Raje was released by the Congress, news agencies reported that the Enforcement Directorate has widened its probe into a foreign exchange violation case against Lalit Modi and others, which involves alleged illegal routing of Rs 21 crore from a Mauritius-based company. This includes the deal with Niyant Heritage Hotels, owned by Raje's son. The ED has apparently written to the Income Tax department, Reserve Bank of India and the Registrar of Companies to obtained detailed information. For the Congress, therefore, this latest document is just the tool it needs to step up its attacks on the BJP and Prime Minister Narendra Modi. The PM has long maintained a no-tolerance stand on corruption of any sort, but has been silent so far on this controversy. Perhaps the appearance of this document will force him to change that. When the neighbours' kids were out playing cricket, Shreyas was umpiring, owing to a disease called laziness. His love for sports never went away, though, so he settled for the easy chair outside the boundary rope and became a journalist, first with ESPN and then, for more than five years, with Mail Today. Now an Assistant Editor with Catch News, his dream is to utilise his other 'talent' and become a humourist. Please don't encourage him by laughing at his jokes!